Get comfy, stylish and environmentally friendly in 7 For All Mankind’s new organic denim Yosemite jeans for women (A, $161, www.7forallmankind.com), made from 100 percent organic cotton, grown from pesticide-free plants. Earnest Sewn also has a new green jean for men and women called the Greencaste collection (F, $200 to $240, www.thebluesjeanbar.com). These truly socially-responsible jeans use organic fabric as well as reduce the environmental impact of the water- and chemical-intensive process of washing and styling denim. Dragon Pearl has a gorgeous Sky Empress Special Occasion Box organic tea gift set that’s sure to please the eye and the taste buds alike (E, $34.10, www.dragonpearltea.com). The gorgeous gift box includes Jasmine Dragon Pearl Green Tea and Bai Mu Dan natural white tea. These recycled newsprint bins (B, $9.99 to $19.99, www.containerstore.com) are perfect for storing current reading materials and plenty more. The hand-rolled and woven bins have a light matte lacquer coating to prevent the ink from smudging or transferring, making them great for keeping linens and books. Green power is at hand with the new HY Mini (C, $49.99, www.hymini.com), a wind-powered universal electronic charging devicethat captures renewable power for iPods, mobile phones, PDAs, MP3 players and digital cameras. The handheld mini green power station comes in three fun colors, including green. Pacifica features soy-based candles (D, $24.95, www.pacificacandles.com) that smell terrific. The candles, which are hand-poured using lead-free cotton wicks and natural essential oils, are the cleanest burning soy candles available. Article published in The San Fransisco Chronicle’s “Holiday Gift Guide” custom publication on December 5, 2007. 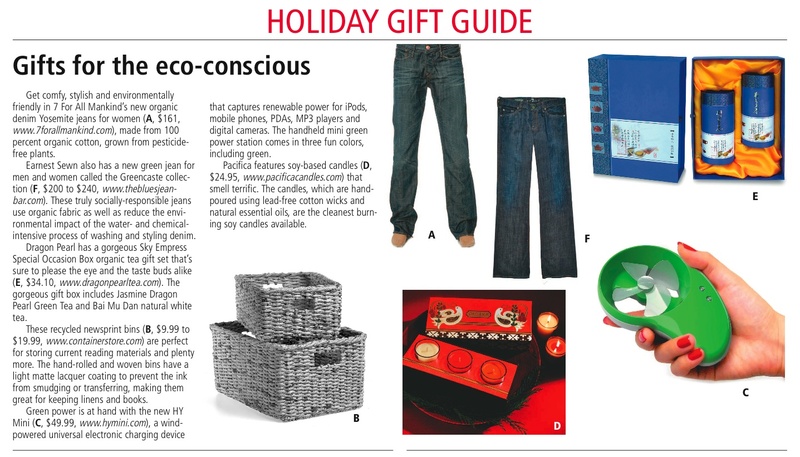 Download PDF of original article “Gifts for the eco-conscious” to view full layout with PHOTOS!